David de Hilster is an American scientist, artist, filmmaker, and musician and dissident scientist the later of which, started with his meeting and working with Argentinian physicist Dr. Ricardo Carezani in 1992 who showed Einstein's Special theory of Relativity wrong in the early 1940s. David is currently president and co-founder of the John Chappell Natural Philosophy Society and is co-authoring a book with his father Bob de Hilster which claims to be the first complete physical model of the universe called Universe Hack 3.0 that is based on Newtonian laws and having no math. As a scientist, de Hilster has worked in as a researcher in artificial intelligence, natural language processing for over 30 years and is co-author of a computer language and IDE for human language called NLP++ and VisualText. De Hilster has been involved with the John Chappell Natural Philosophy Society (CNPS) (formerly the NPA) for over two decades acting as webmaster, conference director, and now president of the non-profit organization. He also helped found the Society for the Advancement of Autodynamics, founded in 1994, promoting the work of Dr. Ricardo Carezani. He is also co-founder of the Natural Philosophy Database, the Natural Philosophy Wiki, and more recently laid the foundation for the online University of Natural Philosophy. De Hilster also produced and directed the feature-length documentary film Einstein Wrong - The Miracle Year starting filming in the year 2005, completing 2014. In May 2017, David started the [Dissident Science YouTube Channel] where he has almost 3000 subscribers world-wide. David de Hilster has a bachelor's degree in mathematics with a minor in architecture from the Ohio State University. He holds a master's degree in Linguistics from Ohio State University specifically in the area of computational linguistics or natural language process - getting computers to understand human language. David de Hilster has been a computer scientist in the area of artificial intelligence and natural language processing working for research institutions and groups in private industry and aerospace. He worked for Battelle Memorial Institute in Columbus Ohio while still in graduate school at the Ohio State University from 1984-1987. De Hilster moved to Rio de Janeiro Brazil and worked in as a programmer for a natural language interface to databases in Portuguese for the company Tecsis from 1987-1990. David married Brazilian clothes designer Doris and they moved back to the United States where de Hilster got a job in the artificial intelligence laboratory in for McDonnell Douglas in Huntington Beach California from 1990-1994. David then moved to the artificial intelligence group at Space Park in Redondo Beach California where he worked for TRW developing software which was eventually picked up and used by a new startup company I-Search who eventually hired him away. In 1999, David became one of the creators of the software programming environment Visual Text (c) and co-author of the computer language NLP++ for the new startup company Text Analysis International. Since December of 2014, David de Hilster has been working at LexisNexis in Boca Raton Florida and in 2016, became a member of the architecture team in the supercomputing research group. David de Hilster was born in Ann Arbor Michigan on Friday, November 13th, 1959 to Robert and Patricia de Hilster while Robert was studying physics at the University of Michigan. David grew up in Galion Ohio and in 1970 at the age of 10, moved to Worthington Ohio where he attended middle school and high school during which he played trumpet and majored in seven subject areas. In 1977, he attended The Ohio State University majoring in Architecture where he was the top student in his class. In 1980, de Hilster studied at New College Oxford England during the summer and having dated a Brazilian in the United States before the trip, went to Rio de Janeiro where he fell in love with the culture and music. Later in 1980, de Hilster contracted a rare intestinal disease coming within hours from dying which changed his outlook and direction direction in life. David began to "live more" as he describes it while still managing a heavy work and study level switching his major to mathematics. In 1980, David enrolled in a Portuguese class where he met a linguistics professor who persuaded him to enter the linguistics department to study human language and computers. While teaching undergraduate linguistics and earning his masters degree, David began working in the artificial intelligence lab at Battelle Memorial Institute using Xero 1108 Lisp machines writing computer programs to understand written language. After graduating from Ohio State University with a Master of Arts in Linguistics, David was hired into the AI department to work on a natural language interface to databases using the language "c". 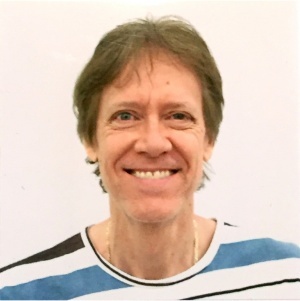 In March of 1987 after finishing the project, David sold everything and moved to Rio de Janeiro where after 3 months, he was hired by a Brazilian company to create Verbo, a natural language interface to databases in Portuguese. In 1988, he met his future wife through a rock climbing club and was married in 1989. At the end of 1989, he moved back to the United States and was hired by the Artificial Intelligence department in Huntington Beach California to convert a natural language program from LISP to the language "c". There he met Amnon Meyers with whom he would collaborate for decades to come. 1990, David started to paint and draw professionally and was accepted into the young artist gallery of the Los Angeles Country Museum of Art. David painted in the evening and weekends, working in artificial intelligence during the week. In 1992, David moved to Long Beach California into a artist loft where he had his first exhibition. De Hilster went on to be one of the most successful artists in the gallery selling painting, and having some of the largest waiting lists for pieces in the gallery. He also continues to sell his works with private collectors. It was also in this year when he met Argentinian physics Dr. Ricardo Carezani who was looking for someone to help spread the word about his work showing Einstein's special relativity wrong. David read his work and started putting the work on the internet in April of 1995. In 1996, David found the Natural Philosophy Alliance and attended their 3rd annual conference in Flagstaff Arizona and joined the group to champion Dr. Carezani's work. There he met many influential scientists which were to eventually contribute to his work on the Particle Model with his father. In 2005, David raised money to shoot the film Einstin Wrong which was a feature-length documentary where David took his mother Patricia around the country to meet scientists working outside the mainstream who were disputing Einstein, the big bang, and plate tectonics. The film was finished by the end of 2013 and in 2014 was submitted to over 80 film festivals world wide. The film made it into the final groups but was cut and never shown in a film festival because of its controversial subject. In 2008, David started to become more involved with the NPA creating a new website and writing custom software for managing the group world-wide. In 2014 he was part of a group that moved 95% of the NPA membership to start a new organization called the John Chappell Natural Philosophy Society of which he became president in 2015. In 1994, David started SambaLa Samba School in Long Beach California in order to form a community for his wife who was homesick for her native Brazil. David put the samba school on the internet in April of 1995 and two years later, created the World Samba Homepage, a cyber gathering place for samba groups around the world. In 1998, David started a plan for all samba groups around the world to meet in Rio for the new millenium to parade. He hooked up with Alessandra Pirotelli and they created the world-wide project Unidos do Mundo which was sponsored by the Brazilian government where samba musicians and dancers from 19 countries paraded with Brazilians in the Sambadrome. David became the first non-portuguese speaking singer to sing in the fabled Sambadrome in Rio. In 1996, David started the Brazilian Street Carnaval in Long Beach which created an all-day event with a Brazilian parade, stage shows, and food and cultural booths. This event persisted through 2010. In 2011, the Brazilian Consulate of Los Angeles asked David and his wife to take over the Brazilian Day in Los Angeles which they ran for 3 consecutive years. In 2014, David and his family moved to Boca Raton Florida and in 2015, they moved SambaLa Samba School to southern Florida where it gained a new group of members which paraded over 150 people in Boca Raton and Pompano Beach Florida. Doris and David also opened up a dance and music studio in Pompano Beach where they continue their Brazilian community work. David is working in the supercomputing group at LexisNexis specializing in user interfaces and natural language processing (understanding the written word). David also helps organize annual conferences for the CNPS as well as continues to develop the organization's marketing strategy as well as growing its website presence. David's current passion is his work with his father on what they claim is the first complete physical model of the known universe in the Particle Model in their book Universe Hack 3.0. In May, 2017, David de Hilster started a new Dissident Science YouTube Channel with daily video messages ranging from 4-9 minutes in length covering topics like relativity, the big bang, plate tectonics, natural philosophy, and criticizing mainstream media writers and personalities. David currently resides in Boca Raton Florida with his wife Doris de Hilster who is a clothes designer and owner of a costume and alterations store in Pompano Beach Florida. He has one child Luanda (2005) with Doris. David is a self described vegan since 2013 who has reversed his heart disease and allergies eating a whole plant based diet which he continues to this day. 2016 - "Earth Expansion Major Objections Solved"
2016 - "Physical Explanation for Greater Earth Expansion in the Southern Hemisphere"
2015 - "Light, Gravity, and Mass: A Particle Theory"
2013 - "No God Particle Renders Particle Accelerators Useless"
2007 - "Gravity Experiment 1 "
2007 - "NeWiki: An Encylopedia for a New World "
1996 - "Autodynamics: a Comprehensive Replacement for Special Relativity"
This page was last modified on 13 February 2019, at 14:50.